In 1746, Samuel Johnson undertook the Herculean task of writing the first comprehensive English dictionary. 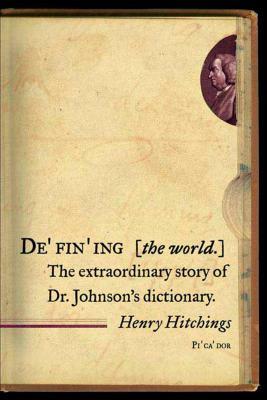 Imagining he could complete the job in three years, Johnson in fact took more than eight, and the dictionary itself turned out to be as much a work of literature as it was an invaluable reference. In alphabetized chapters, from "Adventurous" to "Zootomy," Henry Hitchings tells of Johnson's toil and triumph and offers a closer look at the definitions themselves, which were alive with invention, poetry, erudition, and, at times, hilarious imprecision. The story of Johnson's adventure into the essence of words is an entertainment that "sparkles on every page" (The Philadelphia Inquirer). Henry Hitchings was born in 1974. He is the author of The Secret Life of Words, Who's Afraid of Jane Austen?, and Defining the World. He has contributed to many newspapers and magazines and is the theater critic for the London Evening Standard.